NO backroads to this lake front home and NO steps down a step bank to the water! 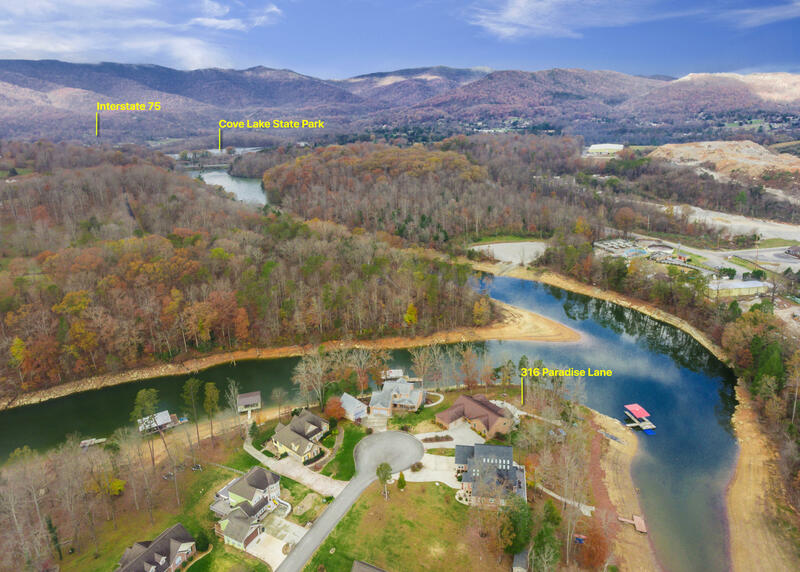 This Lakefront paradise is only 3 miles from I-75 and has a gentle slope to year round water! Home is perfect for entertaining w/ open floor plan, large kitchen w/ gas range, warming drawer, double ovens, wine fridge, microwave, dishwasher, LOTS of cabinets & pantry. Big deck w/ mountain & lake views. Has central vacuum. Basement has huge great room, kitchenette, bedroom, full bath, storage & extra room for office, craft room or mudroom. Step outside onto the HUGE stamped concrete patio w/ prep area for cooking. Enjoy 2 fire pits, bunkhouse, covered dock, fenced area for pets, raised garden beds, pretty kiwi plants & workshop. This home is AMAZING! Square footage is approximate. Buyer to verify.